Maayan Eaves, a second-year student studying communication and arts studies, talks with Jordan Bullock, a third-year student studying animal science, after both win the 2019 Pan-Afrikan Pageant on Wednesday, April 10 in Talley Ballroom. 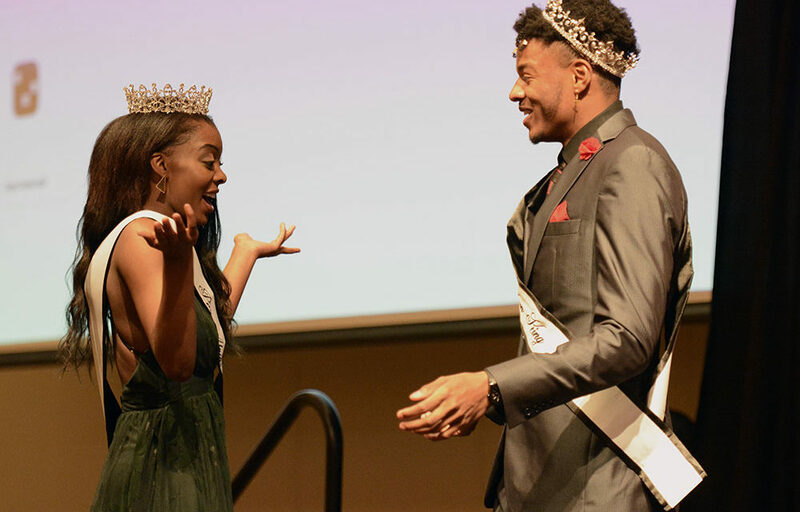 As a part of Pan-Afrikan Week’s festivities, the University Activities Board’s Black Students Board hosted their annual Pan-Afrikan Pageant on Wednesday, April 10. The pageant crowned Maayan Eaves, a second-year studying communication with a concentration in media, and Jordan Bullock a third-year studying animal science, as the Pan-Afrikan king and queen. The pair competed amongst a group of six contestants who represented various colleges and majors throughout campus. The student contestants also shared diversity in their future aspirations, talents, and well-thought-out answers during the question portion of the pageant. The night was hosted by the 2017 pageant winners Will Comer and Jakini Kauba who encouraged audience participation and cheered on the contestants. The audience members were first introduced to the contestants during an opening dance that followed the 2019 Pan-Afrikan Week theme of highlighting black kings and queens. However, being a king or queen in the pageant took hard-work, according to Eaves. For her talent portion, the sophomore and the first contestant created her own background music with an electric guitar and sang a cover of Beyoncé’s ‘1+1’. Many audience members seemed to thoroughly enjoy the performance, as some even gave a standing ovation. Bullock who participated as contestant number six, took a different approach to his talent portion and performed an original piece of poetry. The piece described his experiences as a Black male on the campus of NC State and in America. His performance also gained him points in the pageant as many audience members snapped in approval during some of his relatable verses. Other contestants exhibited their talent through multiple forms of art. Contestant number two, Danyale Calhoun, received high praises for her contemporary dance performance to the ‘Wifeable (Demo 3)’ by Masego. Contestant number three, Kaleb Lee, wowed the crowd with a cover of ‘White’ by Odd Future. Contestant four, Naquana Sessoms performed an empowering poem about the sexualization of Black female bodies. And contestant five, Vanisea Miles paid tribute to South-African culture by performing a combination of gumboot dance and stepping. Calhoun and Lee were later named Mr. and Miss Congeniality for their teamwork and dedication throughout the pageant. According to Black Students Board Chair, Christian Carter, a third-year studying sociology, the goal of Pan-Afrikan Week is to give students a space to showcase their attributes and be recognized as kings and queens. According to Carter, the planning that goes behind events such as the pageant begins almost a year in advance. From choosing the contestants to seeing the winners be crowned, Carter, as well as attendees, were proud to be a part of the night. And the contestants were happy to be rewarded for their hard work. “Winning, just means that I did what I had to do in order to be successful,” Eaves said.